Here's where you can find all the Healing Gourd Seeds scattered around Sekiro: Shadows Die Twice. The Healing Gourd is a huge part of Shadows Die Twice, and it's the main item that you're going to be using to keep yourself alive. 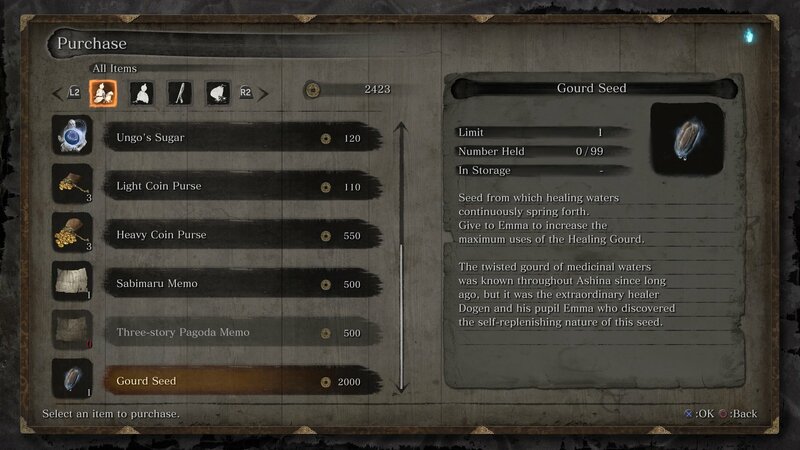 In our full Sekiro Healing Gourd guide, we'll be outlining a complete list of all the Gourd Seed locations in Sekiro, so you can increase the amount of times that you can use the healing item. When you first get hold of the Healing Gourd in Sekiro, you can only use it once per life. Every time you die, or rest up at a Sculptor's Idol, the Healing Gourd refills. To use the item again once it's been deplenished you have to find Gourd Seeds, and then take them to Emma in the Dilapidated Temple hub area. 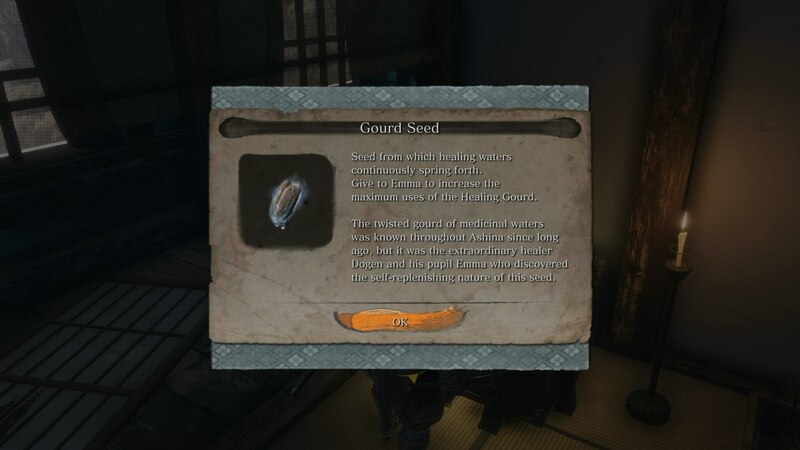 Below, we've rounded up a list of all the locations in which you can find Gourd Seeds in Sekiro. In Ashina Outskirts, just a very short distance from where you start out the area, there's the General Naomori Kawarada mini boss. Defeat him for a Gourd Seed. In the outskirts of Ashina Castle, there's a mini-boss known as the Chained Ogre. Slay the Ogre (or avoid it entirely), then grapple up to the hole in the building behind the Ogre, to reach a room with the Gourd Seed on the ground. In the area adjacent to where you fight Gyoubu Oniwa, you can purchase a Gourd Seed from the Memorial Mob for 1,000 Sen.
At the tallest tower in Ashina Castle, there's the Upper Tower - Antechamber Sculptor's Idol. Right near this, you can find another Gourd Seed within a chest. After you've defeated Genichiro Ashina in Ashina Castle, a new merchant will appear in the Dilapidated Temple. You can purchase a Gourd Seed from him for 2,000 Sen. In Senpou Temple, you'll eventually come to an area with three monks praying in a small shrine. Within this room is the Gourd Seed on the ground. As of right now, this is a complete list of all the locations in which we've found Gourd Seeds in Sekiro. For every Gourd Seed that you bring back to Emma, you'll get another use of the Healing Gourd. When you first start out your journey in Shadows Die Twice, the titular Sekiro is on his way to rescue the Young Lord. Once you've regrouped with the Young Lord, speak to him by pressing X/Square, and he'll give you the Healing Gourd. Pause the game, go into your quick access menu, and set the Healing Gourd to any of the five slots available. You can now scroll through your quick access items by pressing left and right on the d-pad, and once you're on the Healing Gourd, press up on the d-pad to use it. Although using the Healing Gourd will temporarily restrict your movement for right around two seconds, it'll heal a great deal of your overall vitality gauge, and it's your best method of healing in Shadows Die Twice.